NOTE: This is a documentary from 2014, but it's still showing on HBO and is very relevant to what's going on in the world today. Richard Nixon’s crimes against the United States are nearly 50 years old now, and the number of people who remember experiencing Watergate in real time dwindles by the day. Indeed, for those who have no living memory of the scandal, the best-known facts (break-in, cover-up, resignation) must seem a bit quaint by contemporary standards, and the country’s reaction to those events during the 1970s may strike the rising generation as the same sort of inexplicable moral purge that ushered in prohibition earlier in the same century. Fortunately, every time we are tempted to dismiss the furor over Watergate as the naive overreaction of a more sheltered era, Nixon himself returns to remind us that all of this was about so much more than a “third rate burglary.” In HBO’s 2014 documentary, “Nixon on Nixon,” the man himself rails, threatens, blusters, and otherwise bares his twisted, bigoted soul for the benefit of anyone who may have forgotten—or never really understood—what was at stake in the summer of 1974. Nixon’s own White House recordings (augmented here with old news footage) remain the strongest proof that our country once narrowly elected, and then re-elected overwhelmingly, a genuine monster, and after listening to him, raw and uncensored, for over an hour, nobody need wonder any further why his political banishment was treated by his countrymen as a successful exorcism. What is a bit disconcerting, even to those of us who actually remember Nixon, is the man’s utter lack of comfort in his own skin. It is difficult to imagine someone so socially awkward even sniffing the presidency in the 21st Century. His gestures are discordant, he smiles at all the wrong times, and his body language is so defensive that you sometimes want to back away from your own television screen. It’s not just that you don’t believe him; it’s that he clearly doesn’t even believe himself. You may, in fact, find yourself pitying the guy, almost rooting for him as the underdog he always considered himself to be. Just before you get there, however, the documentary provides yet another recording where Nixon dishes out some Himmler-grade anti-Semitism or plots the destruction of yet another innocent political opponent and you remember again why the man was so awkward: he had just enough self-awareness to loathe himself, and in that he was not wrong. As an antidote to pop culture’s tendency to smear Vaseline all over history’s lens, the HBO documentary is a triumph. As a persuasive vehicle for explaining Watergate to Millennials, on the other hand, it falls short. The plot twists that defined the scandal (the flipping of the Watergate burglars, the Saturday Night Massacre, the Smoking Gun tape) are given short shrift by the filmmakers, leaving the impression the scandal was simply an inexorable slog from break-in to resignation, and that Nixon’s goose was cooked the moment that Ben Bradlee paired Woodward with Bernstein. As those who were there will well remember, however, there were multiple moments not just when it seemed that Nixon might get away with it, but when it wasn’t necessarily clear that he was guilty of anything more than lax management of the stooges he employed. And even given the limited time available, no Nixon documentary seems complete without some mention of John Sirica or Margaret Mitchell or Peter Rodino (even Sam Ervin gets stiffed with a cameo role). The documentary, which predates our current political circumstances, nevertheless invites us to compare Nixon’s scandals to those that currently consume the latest occupant of the Oval Office, another man seemingly overwhelmed by insecurity, prejudice, and rage (though nobody would ever describe him as “complicated”). But the comparison is a weak one. 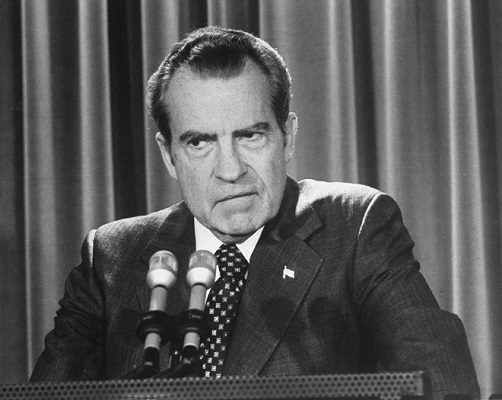 In Nixon’s case, Congress, the courts, and the news media followed the trail of evidence for nearly two years to determine, in the lasting words of Senate Watergate Committee Vice-Chairman Howard Baker, “What did the President know and when did he know it?” Until the very end, nobody really knew the full extent of Nixon’s guilt. In the case of Donald Trump, there is little need for a latter-day Woodward and Bernstein, nor would we be aided much by a trove of secret recordings, whether authorized by Trump himself or smuggled out by, say, Omarosa Manginault. Trump’s deeds and misdeeds are well known and hardly hidden. There is no mystery and even less drama. The issue is not what we don’t know, but rather how we feel about that which is plainly before our eyes. There is a reason that Watergate remains so fascinating 44 years after Nixon’s resignation; nobody will need to write a book like “All the President’s Men” about the Trump Administration. Returning to the 1970s for a moment, it is sad to note that the younger viewer will probably not be shocked by the racism and bigotry that come so naturally to Richard Nixon and his aides. The language itself might now be taboo, but the sentiment has once again been loosed across the land and it is not hard to imagine similar conversations taking place in the West Wing as we speak. Viewed today, “Nixon on Nixon” is a reminder, perhaps, of the aphorism that history repeats itself as farce, but it is also a healthy corrective lesson for those who long for the days when we were supposedly ruled by men of substance who practiced bipartisanship first and put country over party. The man whose voice we hear on those tapes is considered by some to be one of the greatest statesmen of the 20th Century. He is also as mean and vicious a specimen ever to crawl out of the bowels of our politics. And there’s nothing quaint about that.